The hurdy-gurdy is a stringed instrument that produces its sound by the strings being "bowed" by a rosined wooden wheel on an axel cranked by a handle with the left hand. The melody is played with the right hand on keys that activate the two chanterelles. The drones give a constant accompaniment to the melody similar to the bagpipe drone and chanter. The drones are called the grand bourdon, petit bourdon and mouche. The trompette is an additional drone giving a rhythmic buzzing accompaniment that is often difficult to master for the beginner. The instrument is thought to have originated in Europe or the Middle East sometime before the 11th century AD. The first reference has been traced to possibly the 9th century. An early form was the organistrum played by two players and carvings can be seen in various churches including the cathedral of Santiago de Compostella in Gallicia, Spain. In the renaissance, the guitar and lute shaped bodies were developed and also the trompette device mentioned earlier. The lute body, as illustrated here, is especially characteristic of instruments found in France. The hurdy-gurdy, or in France, the vielle a roue, has appeared in a number of carvings and artworks, two examples being Breughel's The blind leading the blind and The garden of earhly delights by Hieronymous Bosch. The latter is the earliest evidence of the "buzzing bridge" or trompette. The hurdy-gurdy has experienced a revival accross Europe of late, and there is an annual gathering of bagpipe and hurdy-gurdy players in Audlem in Shropshire every September and Otley in West Yorkshire also every September. In Europe, the main gathering is at Chateau d'Ars in the Massif Central. Mike's hurdy-gurdy is a lute backed model in D/G made by Neil Brook ( www.hurdy-gurdy.org.uk ) of Preston. It is made from maple with rosewood and maple ribs. 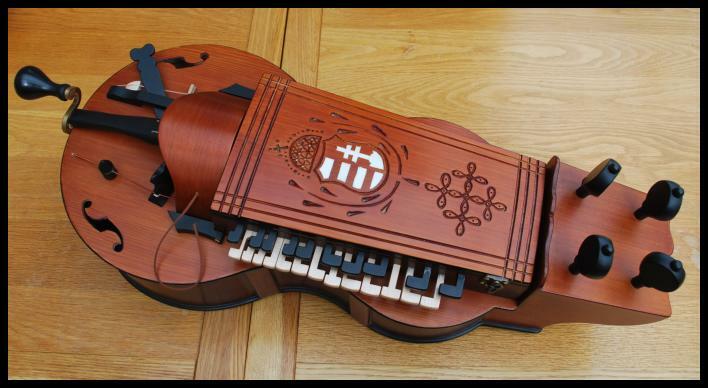 The tekero is the Hungarian hurdy-gurdy which has just one chanterelle, one drone and a trompette. 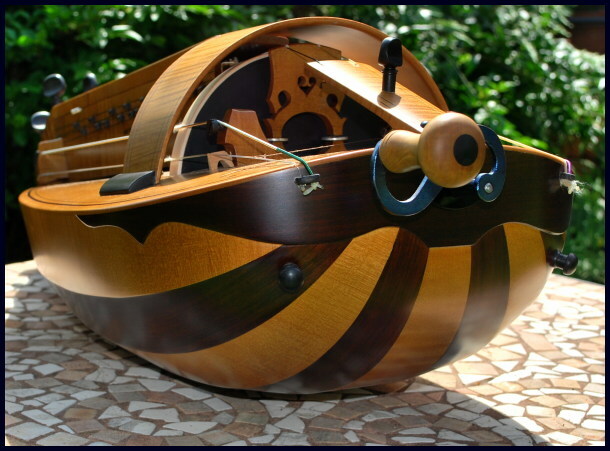 The sound is made by turning a handle which in turn rotates a wooden wheel over which the three strings run. The notes are made by pressing the keys which make contact with the chanterelle string much in the same way as a bow is drawn across a violin string with the left hand fingers making the notes by depressing the string onto the fingerboard. My instrument was made by the Hungarian instrument maker Bela Szerenyil who lives and works in Budapest. He also makes the Hungarian zither known as the citera. 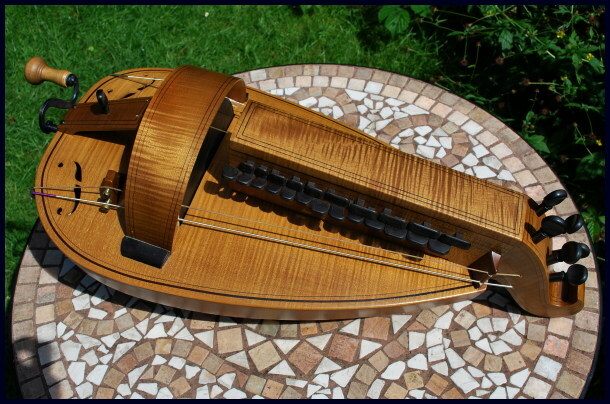 The hurdy-gurdy originates from central Europe and used by most Europeans; first in monasteries and churches, then later played in royal courts around the 15th-16th century. It was greatly favoured by pirates because of its ship-like body. Soon it was played by the general public for it had become an ideal instrument in a one-man-band. Weddings and other celebrations could be entertained with this one instrument. The musician was also able to vocally accompany his playing."